This model of third grade writing describes the beach. Let me tell you about my favorit lake. The water is dark blue and the water feels cool. There is some yellow sand where kids can build cassels. Lots of people go there to swim. Some rowboats are there too. Sometimes people eat lunch by the lake. They eat nachos and pizza. I like those smells. Sometimes I smell sun loshon too. My Favorit Lake by Thoughtful Learning is licensed under a Creative Commons Attribution-NonCommercial-ShareAlike 4.0 International License. 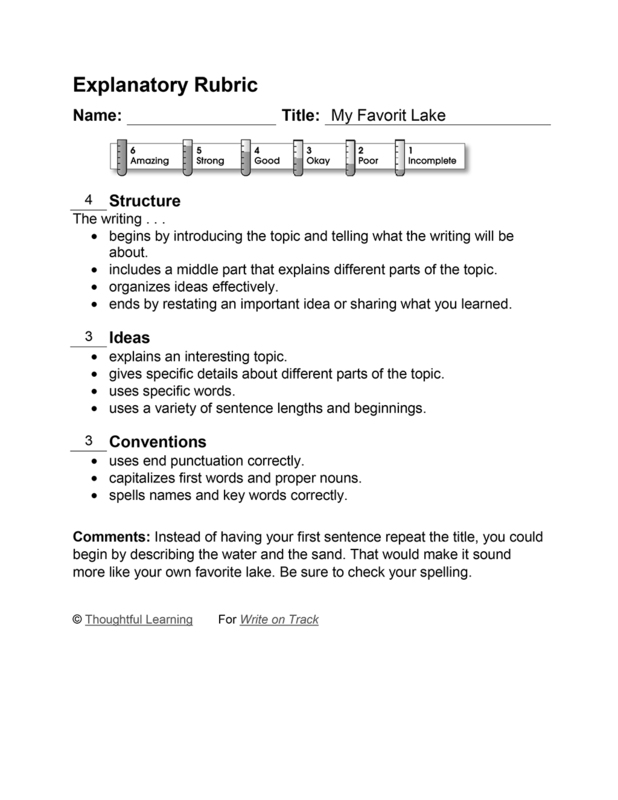 Based on a work at k12.thoughtfullearning.com/assessmentmodels/my-favorit-lake.